Published By – Hollenbeck Music, Inc. Published By – Screen Gems Music Inc.
as indicated by "1 S" lightly etched in the runout areas. 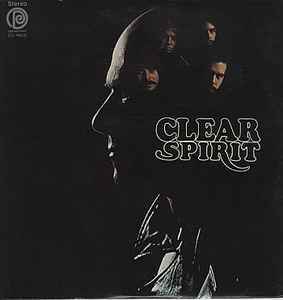 The blistering “Dark Eyed Woman,” sounding more heavy rock and not as psychedelic as I’d always hoped opens Clear, the third album by the legendary band Spirit, arriving in October of 1969 … just in time for Halloween. It was an album that according to the band suffered from a number of inherent issues, feeling that not nearly enough time was available to make the socially pure adventure they’d intended, an album that should have been a step further than their initial offering Spirit, primarily due to a relentless tour schedule, along with scoring the film “Model Shop” which occupied far too much of their time. All of this resulted in the album featuring no less than three instrumentals, being a sheer disappointment to nearly everyone. Of course by the time “So Little Time To Fly” drifted from my speakers, I was sure that all the critics were entirely wrong, that Spirit were indeed onto something good. Sadly, there were to be only minutes that implied brilliance. While the album came across as being very disconnected, there were still the signature blues shuffles fused with their own personal visions of 60’s quirky rock-jazz indulgences, indulgences that paled when compared to the Spirit album from the year before, signaling an uneasy rift and the coming of Jo Jo Gunne. Some of the strongest efforts are housed within those three instrumentals, yet even those seem not to have been fleshed out and as deeply considered as they should have been, especially for such a highly regarded band from a seminal period in time, leaving the album to sound uninspired and for the most part, draped with lackluster lyrics. There’s nothing that’s mythical, mystical, magical, hazed or darkly mysterious to be found here. It’s as if Spirit had sidestepped Topanga Canyon, the acid, the Bay and everything else that went into creating the elusive Summer of Love atmosphere. This album, from a band who loomed larger than life, almost defiantly lacks any vision or emancipation, where except for a few numbers is entirely earthbound, confined and unremarkable. Spirt’s self-titled first offering is perhaps their only album that stands as a brilliant masterpiece, one that defined a time and space and one that influenced many. All of their other records do nothing but add songs to an eventual collection of ‘best of’ material, which broke my heart, as I’d always imagined that Spirit would soar the ethereal currents like some west coast Moody Blues, singlehandedly defining what 60’s inspired psychedelic music was all about. So while I never got that, I did manage to add a couple of solid tracks which would find their way into making a splendid collection that lets all of this silliness drift off into nothing … leaving me awash in the pleasure of who Spirit almost were. *** The Fun Facts: Spirit was originally known as The Spirits Rebellious, after a book by the religious mystic Kahlil Gibran. The number “Coral” included as part of the Sony reissue and available as part of the “Model Shop” soundtrack, regards and is a dedication to groupie Coral Shields, the eleven year old sister of Sable Starr (known as the reigning Queen of the Groupies in LA, who was also involved with Randy California), whom was being dated at the time by Randy California. Spirit were on of those bands who decided (actually the doings of Lou Adler) to skip out of Woodstock, even though Jimi Hendrix, whom Randy California had played with, personally invited them, saying they could have the slot right before he closed the show. Randy California once kicked Neil Young off stage when he showed up uninvited and wandered on stage hoping to jam with the band.